When we come to buy Japanese sake it is useful to be able to make an informed choice. Part of that is being able to determine what foods a particular sake will pair with. Sake is a remarkable beverage to pair with food and it is a lot more versatile than people think. Gone are the days when sake was only paired with sushi or other Japanese foods; a new wave of young, innovative risk-takers are realising the promise ‘sake wine’ holds and are pairing it more and more with non-Japanese cuisine. Did you know Heston Blumenthal serves sake at the Fat Duck? 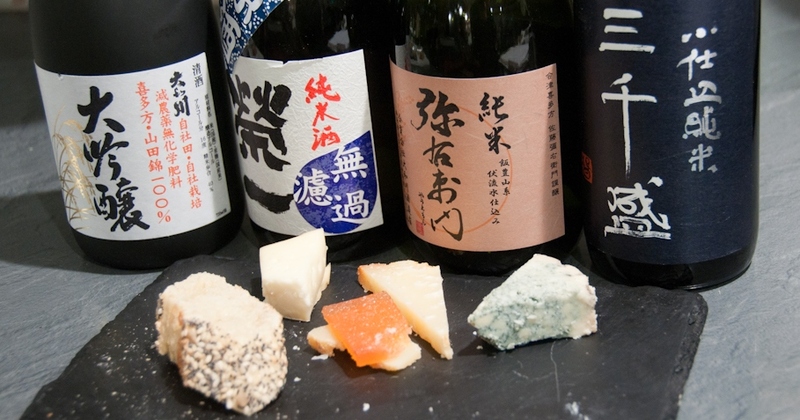 Did you know sake goes fantastically with cheese? Did you know sake and oysters are a match made in heaven? The same ideas and lessons we’ve acquired from wine can be used when pairing sake with food. There are plenty of in-depth articles on this subject elsewhere on the web (and indeed comprehensive books) so I’m not going to go into much detail here as any attempt would provide a disservice. However, in summary, with wine you have the options to contrast or complement a food, so when we are matching sake with food. Flavour. You might, for example, wish to COMPLEMENT a rich, savoury food with a rich, savoury sake; or a light-weight dish – like lean fish – with a similarly light-bodied sake. Conversely, you could choose to CONTRAST: a fruity, citrus sake on savoury food (think of the kinds of foods you might squeeze lemon over). Texture. A sake‘s texture – i.e. its mouthfeel and body – can range from very structured to soft and subtle. These two variables are fun to play with when pairing with food. Think of a really textured meat like pulled pork, this is a great one to find an equally structured sake (full-bodied, acidic) to COMPLEMENT it. Alternatively, something very smooth and dry might just cut through the oil in the pork and provide a very interesting CONTRAST! Acidity. Use a sake‘s acidity to your advantage. The acids in a sake help break down lipids (fats and oils) and spread flavour throughout your mouth. Fatty fish (especially when served raw) really benefits from a sake with a little more acidity. When these are combined you allow the sake to do all the hard work by dissolving the fats and gently diffusing the wonderful flavours around your mouth. At the same time, too much acidity might overwhelm simpler foods. We give the acidity value of each sake we stock in our shop and on each bottle under the ‘Master Specs’ section. This metric varies between 0.7 and 2.5-ish; anything out of these ranges is quite extreme. More detailed info on Master Specs can be found on this page. Temperature. As some sakes respond so well to heating this is an important factor to consider when pairing sake with food. As discussed on the sake and temperature page, temperature affects a sake‘s flavour and characteristics. From a food pairing point-of-view it is important to anticipate the change on flavour/fragrance but also the change in the perception of alcohol. The volatility of alcohol gifts warm sake with the ability to disperse flavours around the mouth more than cool sake (alcohol is also a solvent of fats too, like acid – see below). Furthermore, olfactory taste is enhanced. Temperature also speeds up the movement of molecules in a sake (and gives them more energy). Thus the acids & alcohols in a heated sake will also do more work than when they are colder. This is important as it can be quite easy to overwhelm a delicate flavour – let’s use our fatty sushi, say chu-toro (medium fatty tuna), example – with an already acidic sake that you’ve decided to heat. Better to choose a less acidic sake, heat it up, and let the temperature do the work. (In fact this is one of my all time favourite combinations! Warm sake with fatty sushi. Boom.) Which brings me onto my final point regarding temperature – you CONTRAST or COMPLEMENT this too! The juxtaposition of cool sushi and warm sake is magical but the marriage of a cool, crisp salad and a cool, dry, crisp, sake is also sublime. Umami. Just as there are lengthy, detailed books on wine and food pairing, so too are there lengthy, detailed books on umami! But a superb place to get info online is the Umami Information Centre, I definitely recommend you check it out. What is umami? Umami is the ‘fifth taste’ discovered in 1908 by a Japanese scientist, Kikunae Ikeda, after having contemplated his breakfast bowl of miso soup. It was he who isolated and identified glutamate as the cause and, since then, two other amino acids – the inosinate and guanylate nucleotides – have been identified as causing the taste. I could go on listing foods and talking about what umami is but we’d really just be replicating what the Umami Information Centre‘s work so go check them out, it’s fascinating. With both wine and sake you have the option of contrasting or complementing a food, with sake you also have the option of intensifying the food. Umami has a synergistic effect. If you put umami flavour with umami flavour then you end up with an umami explosion. That’s why your rich jus or gravy works so well with your roast beef! Those two things are both umami rich in their own right but when you combine them the result is an exponential increase in umami. You can do this effect too by choosing an umami-laden sake! Pairing foods and sake that have a lot of umami is very exciting and can unlock some wonderfully delicate and intriguing combinations: cheese and sake is an unexpected revelation! Try a blue cheese with a yamahai, kimoto or bodaimoto sake: amazing! Try rich Italian tomato sauces on pasta with a junmai: superb! But how do you know if your sake has a lot of umami in it? A metric has been developed to help here, most suppliers don’t quote it and a lot of breweries don’t give it. At Tengu Sake we quote it for all our bottles. The scale generally runs from 0.7 to 1.7, anything above that (such as Hayashi Honten’s yamahai junmai Black Samurai at 2.0) is seriously umami-tastic. We don’t claim to be experts on sake and food pairings but we hope what we’ve suggested here are some ideas. The best advice we can offer is for you to play, there are no rules. Try sake with a whole range of foods, especially non-Japanese, and discover some fantastic combos (and probably some terrible ones!) along the way. Then come back and tell us all about it!